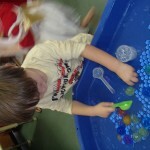 What better way to start the year than with a sensory activity like waterbeads. In the hot weather the beads feel so cool to touch. We added some measuring containers like spoons, cups and beakers, to extend this play. 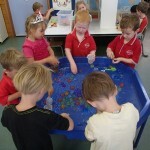 Our water beads consisted of a mixture of the small ones and some giant ones – in all different colours.